Liver is probably the most widely accepted and well known of the the organs we eat (beef, chicken, deer, etc). It’s kind of a tradition with deer hunters on the night of the harvest to cook the liver usually fried with onions. Most hunters that I know still do this but from what I’ve heard it’s becoming less and less common. 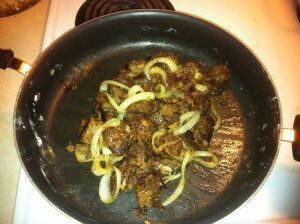 This year I used the recipe below for fried venison liver and onions the night of harvesting my first deer (a doe). 2 days later I harvested my second deer and decided to freeze the liver and the heart for later use. I’m sure it won’t be as good as eating them fresh but we will see. Soak the liver pieces in milk for up to 2 hours or however much time you have. This will take some of the game taste out. Use 2 tablespoons of the butter to saute the onion slices over medium heat until the onions are soft. Drain the milk from the liver and coat liver slices with the flour. Add the flour coated liver pieces to the melted butter in the skillet and cook on medium high heat. Cook until golden brown on the bottom and the turn and repeat for the other side. Add the onions back to skillet and continue to cook just a little longer over medium heat. Be sure not to over cook. The liver should be tender and maybe just a bit pink in the middle.